Why do I have so much lower back pain and sciatica? The spine is an intricate and complex supporting structure composed of bones, muscles, ligaments, tendons and discs. The discs are cartilage-like pads found between vertebrae that act as cushions and to increase movement in an otherwise solid structure. All causes of back pain arise from problems with these component parts. For some people no specific cause of lower back pain is ever found. There are several different ways to discuss lower back pain causes, using different categories or time lines. The problem with making this discussion accurate and meaningful is that the different causes of back pain tend to blend and evolve over time into different problems. Trauma (a cause of back pain) eventually becomes arthritis (another cause of back pain). There are actually two kinds of lower back pain: acute back pain – lasting for a short time, approximately one to three weeks or so – and chronic back pain, lasting three months or more. Acute and chronic low back pain causes are the not the same. Generally, the younger the person is with back pain, the more likely the pain is due to one or more disc spaces directly (lumbar disc herniation or degenerative disc disease). The older the person with back pain, the more likely the pain is due to one or more areas of spinal joint degeneration (osteoarthritis, spinal stenosis from a chronic facet syndrome, etc.). The pivotal age is about 40 years, so that someone younger than 40 would tend to have lower back pain causes that tend toward acute injury, while someone over 40 would tend to have back pain causes that tend toward chronic degeneration and low back arthritis; of course, there are always exceptions to this construct. Causes of lower back pain of recent onset and short duration are most often due to muscle and ligament strains that usually occur with overuse or sudden jolting or twisting of the lower back. This type of soft tissue injury is typically not serious in the long term if it is not repeated too often and if it is given appropriate treatment. Even though acute back pain problem is a limited event it can be extremely painful and greatly limit ability to move and function normally. Typically, lower back pain from a muscle strain or similar soft tissue injury like a pulled back muscle will get heal within one to three weeks. Acute back pain treatment usually requires a short period of bed rest or at least moderately to greatly reduced activity, application of cold packs initially to the area of greatest pain followed by hot packs as pain subsides, and perhaps limited use of pain medication. Over the counter pain medication used to reduce pain associated with muscle, ligament or tendon strain can include, aspirin, acetaminophen (Tylenol), ibuprofen (Advil), Motrin, or naproxen (Aleve). Prescription pain medications may be recommended for severe back pain. Facet joint pain is often located near the midline and tends not to radiate to far or cause much sciatic pain, unless accompanied by disc involvement which does happen. Causes lower back pain in people over 50 years of age, less so in those who are under 30 years of age. Facet related pain tends to be more painful when standing or when extending the spine. A. Two articulations of joints in the low back below the bottom lumbar spinal bone that are immediately under the two dimples of the buttocks. These bear the weight of the upper body and transfer it down to the lower half of the body. B. Heavily reinforced with ligaments that can become strained and sprained, as well as a SI joint capsule which is endowed with many nerve endings. Injury to any of these structures is painful. C. Accounts for about 20% of lower back and buttock pain. D. Sacroiliac joint pain tends to be relieved by non-weight bearing and by slow easy walking. When back pain is partially of solely caused by the wear and tear type of arthritis (osteoarthritis) the pain and many related symptoms like swelling and stiffness can be helped by treatment with acupuncture or acupressure. The basic format for treating acute or chronic low back pain problem, and getting low back pain relief is more likely when multiple therapies are used for at least a few weeks to give the tissue time to respond. There are a series of simple and effective things a person with back pain that comes from a pinched nerve can do that can be very helpful in many cases. Review pinched nerve treatment to learn how to help yourself and learn how to manage your painful back; many people reduce or eliminate the need for more aggressive medical treatment. What are less common back pain causes? Pathology and disease of certain organs more commonly are known to give rise to back pain because of their anatomical location. It is important that not all back pain is looked upon or treated as a structural problem. For this reason non-responsive back pain should be evaluated by an internist to determine if organ pathology is not a cause of back pain that otherwise eludes effective treatment. 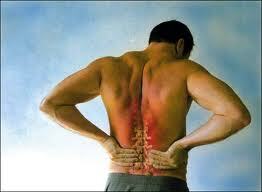 Kidney trauma, infections or stones frequently cause low back pain.. The rapidly growing baby positioned near the base of the spine in pregnancy commonly leads to low back pain by changing the mother’s center of gravity to mechanically stress the lumbar spine, as well as increasing the depth of the normal lumbar curvature. Estrogen and relaxin are two female hormones that are increased during pregnancy to loosen the pelvic ligaments in preparation for delivery, contributing to altered pelvic and spinal mechanics – and pain. Ovarian cysts, uterine polyps and fibroids, and endometriosis frequently cause lower back pain and tension. .
Abdominal tumors can cause lower back pain, whether benign or malignant. Primary bone tumors of the spine or pelvis or secondary tumors of the spine or pelvis that start elsewhere and spread to these areas are notorious low back pain causes. Paget’s disease of the bone is a condition of unknown cause. It results in abnormally weakened bone and deformity that can cause mild to severe bone pain. In people with shingles, the chickenpox virus is activated after many years of dormancy to cause infection along the sensory nerve, leading to nerve pain and usually an outbreak of tiny blisters along the pathway of the infected nerve. The pain of shingles can be extreme.